Honoring your physician this Doctors’ Day is easy and with your generous gift, you can show your doctor that his or her work has changed your life or the life of a loved one. You’ll also make a difference in theirs—by reminding them why they do what they do, each and every day. Your gift is twofold—not only does it honor your physician, but it also provides lifesaving care to Einstein patients today, tomorrow, and well into the future. 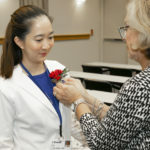 In addition, both Einstein Medical Center Philadelphia and MossRehab honored physicians and staff identified by patients for their outstanding care and commitment to excellence. In honor of Doctors’ Day 2018, more than 400 grateful patients said “thank you” to their physicians with more than 500 individual tributes!